Fun evening tonight playing with a newly introduced camera, over some Texas barbecue. Charles from Olympus was in town and we had dinner. The E-PL7, Olympus’s newest micro 4/3 camera, was announced just yesterday. 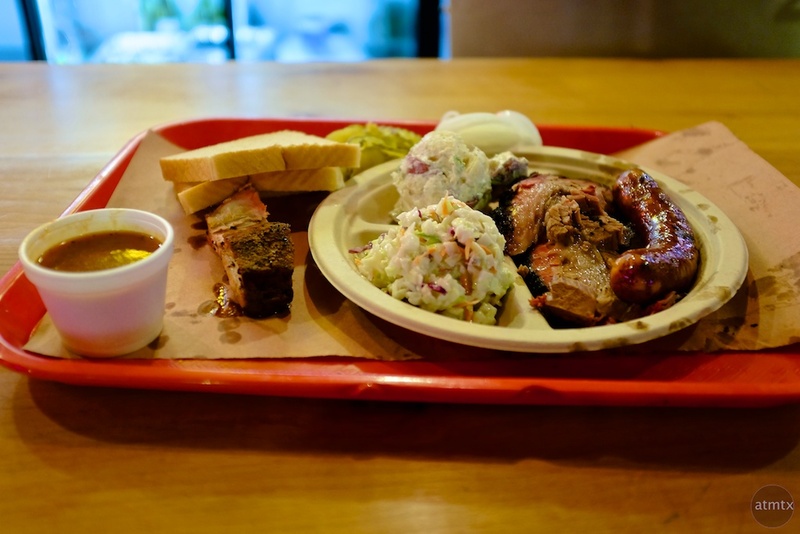 We went to Stiles Switch a relatively new BBQ place in the mid-town Austin. 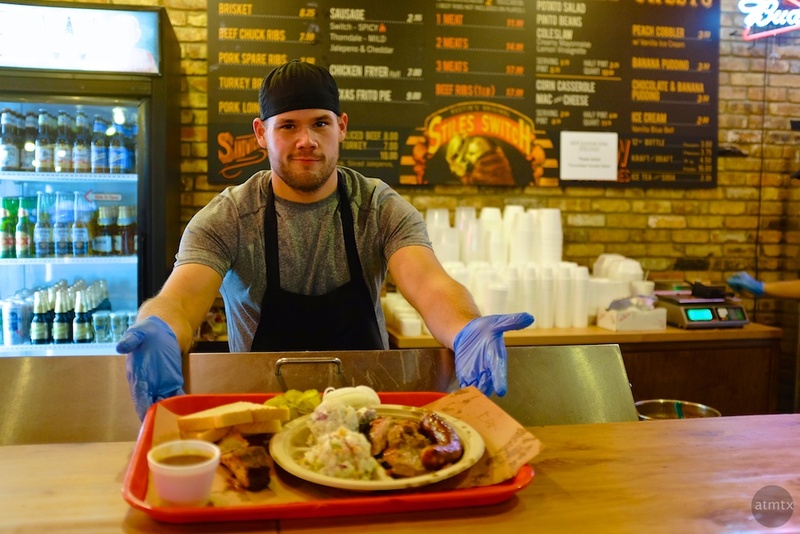 There are so many new BBQ places that the competition must be tough. The Brisket and sausage were good but the beef and pork ribs were especially outstanding. I may do a comprehensive review of this camera in the future but for now let’s say the E-PL7 is an evolutionary upgrade to the Pen line. All of the current Olympus micro 4/3 cameras pretty much use the same sensor and processor. Sure there are some minor differences but the image quality is all very similar. What sets these models apart are their features and ergonomics. For now the OM-D line has built-in EVFs (Electronic View Finders), the Pen cameras are smaller with optional EVFs. 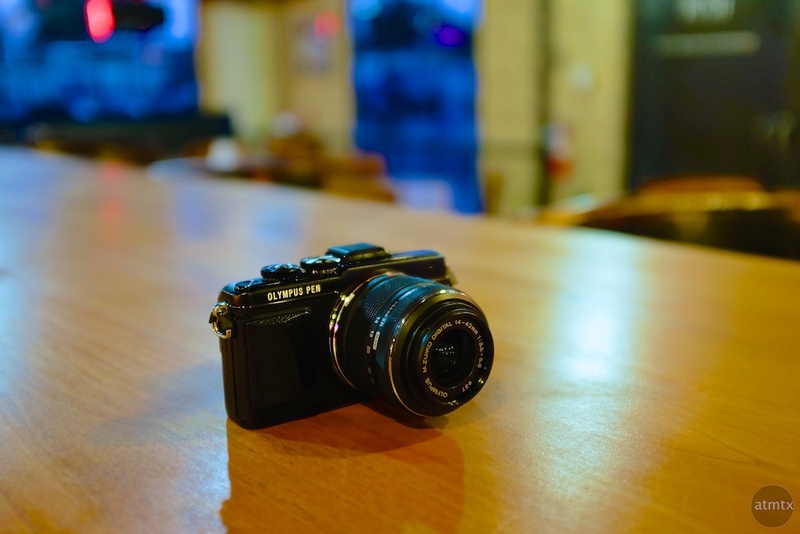 The E-PL7 is currently the entry-level model for Olympus’ 2014 mirrorless lineup. I’m assuming that the E-PM2, which I own, will not be updated. Much of the features of the E-PL7 are identical to the OM-D E-M10 that I reviewed. The E-M10 is $100 more but gives you an EVF. The E-PL7 adds a couple of new art filter effects and it’s biggest feature is a tiltable screen that make it easy to shoot selfies. This feature is well implemented, making good use of the touch screen LCD which adds a virtual shutter button. This new camera adds premium touches, a nice looking faux-leather cover and tasteful chrome accents. In some ways, it seems slightly more upscale than the E-M10 but the difference is subtle. The E-PL7 seems more dense that the E-M10 but the Pen is actually 12% lighter. But the Pen is also noticeably smaller so maybe that’s what gave me the impression of a more dense camera. Aesthetically, the camera seems better than the $599 body only price would indicate. Other mirrorless cameras in this price range, from Sony and Fuji, have plastic bodies which feel cheap but they benefit from a larger APS-C sensor. However, the 3 axis in-body image stabilization in the Olympus somewhat offsets the smaller sensor size in some cases. If you want the least expensive and smallest 2014 Olympus mirrorless then the E-PL7 is for you. However, for only $100 more, the OM-D E-M10 gives you a lot more features. You get an EVF, a built-in flash, a superior grip and two control dials. It will be interesting to see whether you find any improvement in image or handling when compared to the E-PM2. The truly beautiful work you’ve done with the E-PM2 (in particular, with the Panasonic prime lens / wide angle converter) would be hard to top. If the E-PL7 still offers only the same 3-axis stabilization included in the earlier Olympus cameras and the same pixel count I think we can write it off as a necessary marketing move to have something “current” for sale. Amazon is offering the E-PM2 from its own inventory at $293 with lens as of August 29. That strikes me as an amazingly good deal, one I’d grab if it weren’t quite so duplicative of what I already own. I don’t anticipate any improvement in image quality over the E-PM2. 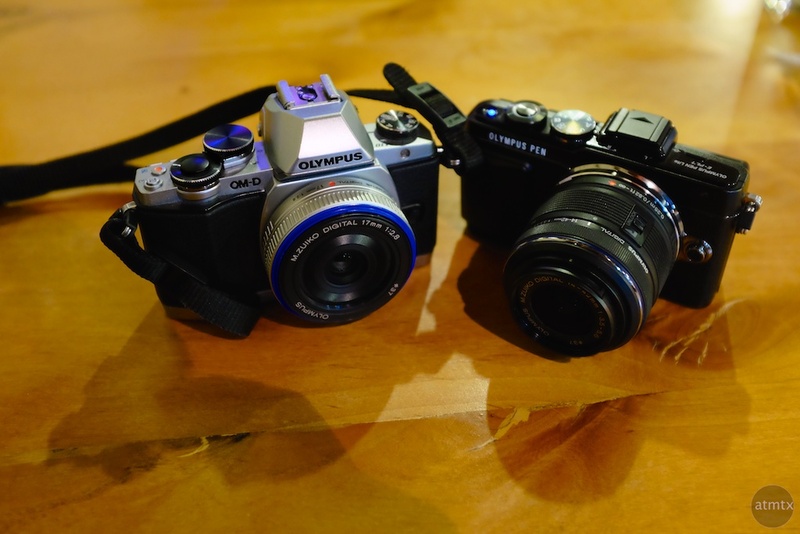 That camera is tops on my list for price vs. image quality in a mirrorless. I expect the E-PL7 will have noticeably better image stabilization since the E-M10 is much better than the E-PM2. The controls are better and the tilting / flipping screen makes it more enjoyable to use. Finally, the camera is built a lot better and looks more “expensive” especially compared to the mostly plastic E-PM2.